held a ‘housewarming party’ at a development of newly built private rented flats in Stratford, east London, in protest at soaring private rents and the government’s failure to tackle the problem. London rents have been rising at around 7 per cent per year. 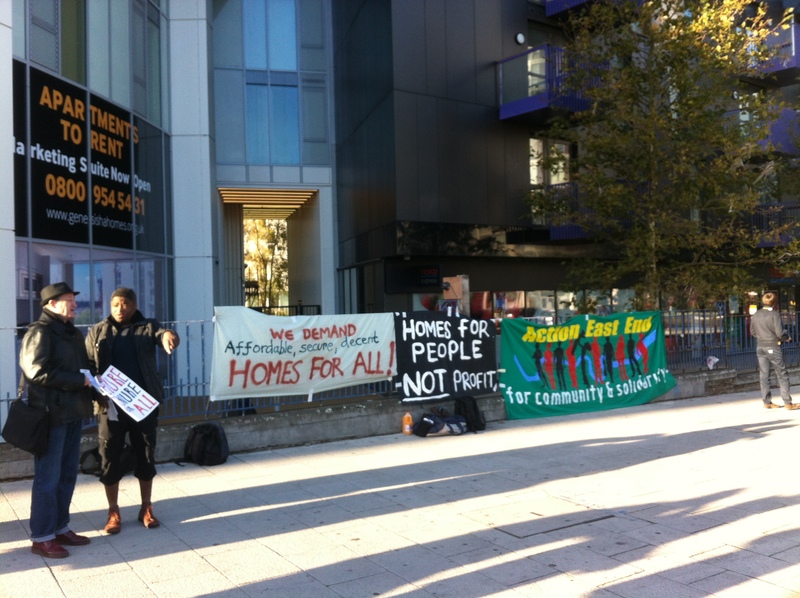 10 others held a solidarity protest outside the Genesis tower block (see photo below). The flats are built and let by Genesis , which has been shortlisted to receive funding through a government subsidy scheme  for private rented housing in three developments in London . Rents in the occupied development, marketed as ‘Stratford Halo’, start from £1,700pcm for a two bedroom flat, the minimum size needed for a family with children – of which there are now more than 1.3 million renting from private landlords in England . Based on figures published by Shelter, these rents would only be affordable to families with an income of £76,000 or more . For further information, images, footage and interviews, please contact letdown.action@gmail.com. 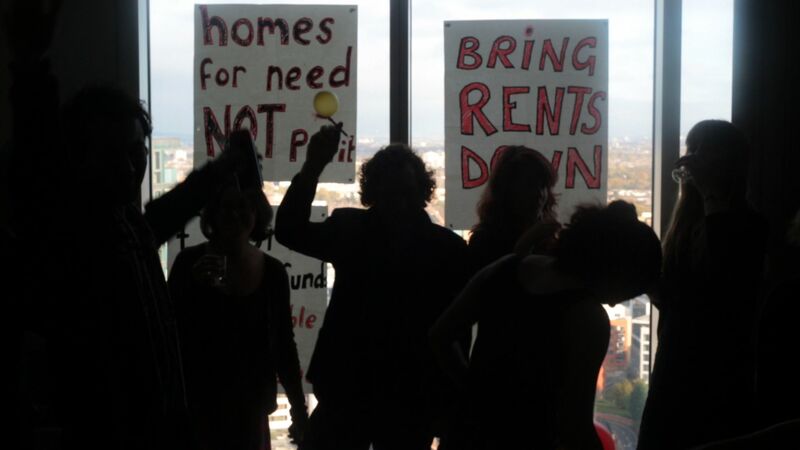 The London Renters network aims to share resources for taking action on private tenants issues; support people to set up new private tenants groups in their borough and campaign together against developers, landlords, letting agents, government or anyone profiting from or exploiting our basic need for housing. 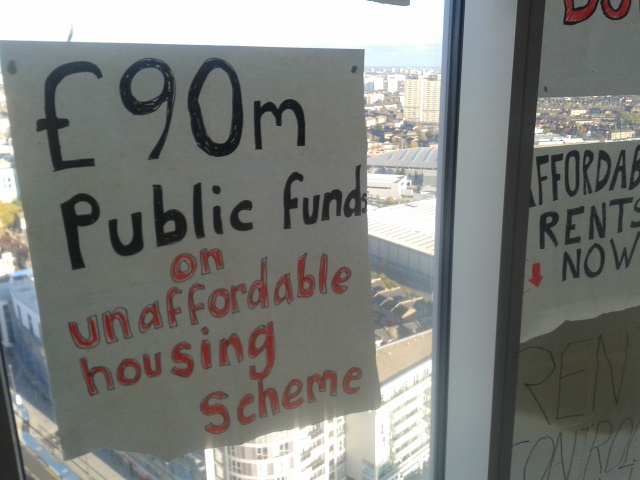 Contact londonrenters@riseup.net for more information and to sign up for regular announcements. 1. Figures published by LSL Property Services found that London rents rose 7.9 per cent in the year to March 2013 – eight times faster than wages. 2. According to its 2012-13 financial statements, “Genesis aims to be a leading property based service provider”, providing housing for sale and rent (at both social and market rents). The company had a turnover of £293m and made £36.7m from sales of property in the year to March 2013. It also received £34.3m in grants. In ten years time (2022-23) the company is projecting an operating surplus of £73m. 3. The Built to Rent fund provides subsidised finance (through loans or equity) to private developers for privately rented homes which will be let at market rents. £1bn is being made available through the scheme, with 43 companies with a total of 45 bids currently being assessed for the first £700m of finance – an average of £15.6m per project. A total of 15 London developments from 12 developers have been shortlisted to receive funding through the scheme. 5. The English Housing Survey 2011-12 finds there 1,306,000 households with dependent children renting privately. 6. Shelter’s Private Rent Watch studies are based on rents being affordable if they take up no more than 35 per cent of net income. At a rent of £1,700 per month, the cheapest two bedroom flats in the Stratford Halo development would only be affordable to households with a monthly net income of £4,857, or £58,286 per year. This equates to a gross income of around £76,000 per year (assuming two earners with equal salaries, claiming child benefit for one child and having no other income). 7. Calculation based on funding provided through loans to developers with A-AAA credit ratings and normal collateralisation for a ten year period, with annual interest payments and the principle repaid at the end of the period. At current interest rates, developers will pay 1.74 per cent interest (source), yet the government pays 2.66 per cent (source). The minimum cost to the government of the loans (excluding operating costs for the scheme) is £92m (lending money at 0.92 per cent below their cost of borrowing £1bn over the ten year period). The effective subsidy to the developers is estimated at around double this figure, as the developers are able to benefit from access to loans at a considerably lower rate via the government than they would be to access themselves directly on the market. This entry was posted in Uncategorized by letdownblog. Bookmark the permalink. Reblogged this on DIY Democracy / Community Democracy. 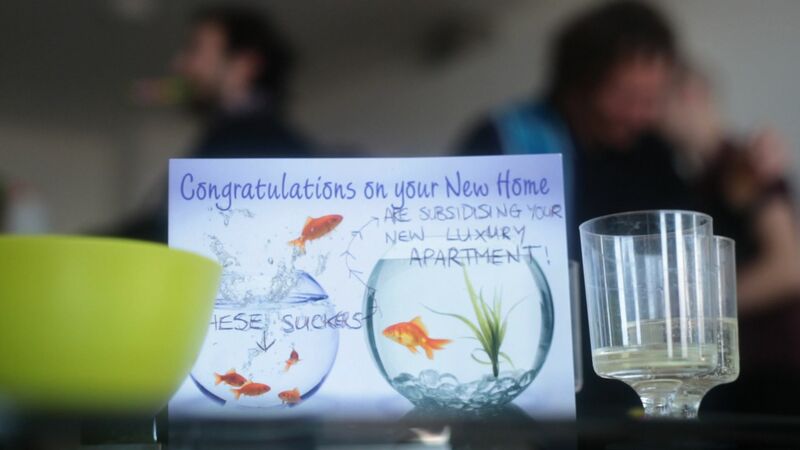 Pingback: THIS WEEKEND: LONDON RENTERS, GREENPEACE & OCCUPY THE BBC. You do realise that Genesis is a social housing org, which means it’s non-profit? Genesis Housing Group consists of Gensis Housing Association (which is the bit you’re talking about), Genesis Community (a charitable foundation) and Genesis Homes – which is the bit providing homes for ownership and market rent. Unfortunately, even the housing association part isn’t very pleasant – they were recently the target of protests for attempting to pre-emptively evict people from temporary accommodation they were managing. See http://www.haringey.org.uk/content/debtwelfare/250-report-of-protest-at-genesis-hq for more on this. I’m all for giving it to companies when they get it wrong, but you might want to look into your facts a bit more on this one. Same with the post you linked to. Which facts do you think we got wrong? A very well informed post! Such an interesting protest, I’ll be curious to see where this goes!